Criminal Mischief – On June 10, 2015, Patrolman Sean Langan responded to the beach area for a report of criminal mischief. Upon his arrival, he was met by Beachwood Public works personnel who had discovered damage that was done to the electrical outlets on the dock at the beach area. 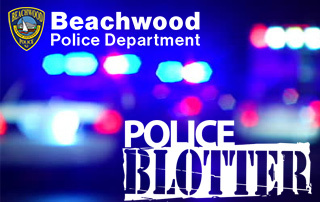 Narcotics Arrest – On June 11, 2015, Beachwood Police Detectives along with members of the Beachwood Police Department executed a search warrant at 118 Barnegat Blvd., Beachwood. The court authorized search warrant was the result of a narcotics investigation initiated by detectives. During the execution of the search warrant, Barnegat Boulevard resident, 22 year old Gianna Florio and 28 year old Brandon Pascarella were arrested and charged with possession of heroin with the intent to distribute, possession of drug paraphernalia and possession of hypodermic syringe. Both subjects were lodged in the Ocean County Jail in default of $50,000.00 bail each. Motor Vehicle Accident – June 11, 2015 at approximately 7:30pm, Patrolman David Bowden responded to the intersection of Birch Street and Double Trouble Road for a motor vehicle accident involving two vehicles. As a result of the investigation, Patrolman Bowden arrested Mariano Domingo, 59 year old Beachwood resident, who was the driver of one of the vehicles; charging him with driving while intoxicated along with several other motor vehicle violations. The subject was processed at Beachwood Police headquarters and released as per John’s Law. Criminal Mischief – June 13, 2015, Patrolman Andrew Altman responded to a residence on the 1100 block of Berkeley Ave., at approximately 1:30am for a report of a mailbox damaged. The resident advised that they heard a noise outside and upon checking noticed the mailbox damaged. Trespassing – On June 13, 2105, Patrolman Sean Langan was dispatched to a residence on the 100 block of Anchor Ave., for a reported trespassing incident. Upon the officer speaking with the resident, they reported that some time between May 30 and June 13 someone opened a window to the residence. It was unsure if the residence was entered but nothing appeared to be missing at the time of the report. The residence was unoccupied during the mentioned dates. Warrant Arrest – On June 15, 2015, Patrolman Justin Apel conducted a motor vehicle stop on Route 9 and Route 166. It was determined that the driver, Andrew Durante, 27 of Toms River had an outstanding warrant from Brick. Mr. Durante was arrested and transported to Beachwood Police Headquarters for processing, and was then released pending court proceedings. Criminal Mischief – On June 15, 2015, at approximately 5:20pm, Officer Gina Bruno was dispatched to a residence on the 900 block of Ocean Ave., for a report of a mailbox damaged. The resident reported that some time between the hours of 07:30am and 5:15pm on June 15th their mailbox was damaged.